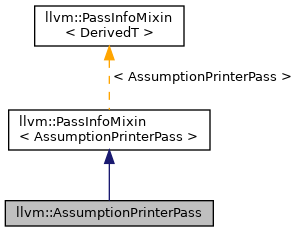 Printer pass for the AssumptionAnalysis results. Definition at line 168 of file AssumptionCache.h. Definition at line 172 of file AssumptionCache.h. Definition at line 224 of file AssumptionCache.cpp. References llvm::PreservedAnalyses::all(), llvm::AssumptionCache::assumptions(), F(), llvm::Value::getName(), llvm::AnalysisManager< IRUnitT, ExtraArgTs >::getResult(), and I.